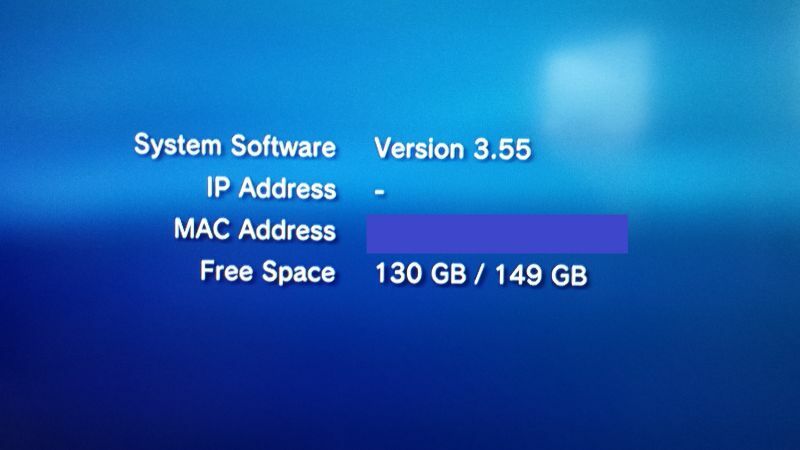 Downgrade any CFW PS3 to 3.55 or any other CFW - Steven B. Awesome projects with guides blog! Nazi Zombie Eisden, Zombies Invade Belgium! Changing to another CFW distribution can be a problem since not all CFW support the latest updates, this guide will help you installing any other CFW version on your PS3 or simply go back to 3.55 where it all started. Accidental upgraded PS3’s from CFW to Official Firmware CANNOT be downgraded using this method, these can only be downgraded using a flasher. Before updating, remove your Game disk, this may cause your ps3 to update to the version that came with the game and make your ps3 unable to downgrade without hardware flasher! Your PS3 is now downgraded to 3.55, however, this is not a fully functional firmware we will need to convert this 3.55 to any CFW to get back jailbreak functionalities. L1 + L2 + L3 (press left stick) + R1 + R2 + dpad_down and you should see the following menu appearing: if not working, restart your ps3 and try again. !!! – Only continue if your QA-Flag is enabled – !!! You will not be able to install any CFW yet, the syscon version is 9.99 so we need to fix this with the 3.55 Rogero’s firmware: Copy the file on your USB stick (overwrite the downgrader file) and insert the USB in your PS3, now go to Update and choose to update from Storage Device. the firmware should say 4.25 however the firmware installed is 3.55, the 4.25 is just a version spoof so the firmware runs newer games and eventually can connect to PSn. This is a functional firmware however it is recommended to update to a newer CFW. Now verify that the version you are installing is correct and make sure it is not an Official Sony Firmware. If you are 100% sure then click ok and your PS3 will restart, update then restart in the chosen firmware. Check your firmware version to confirm your update was successful. This entry was posted in PS3 and tagged 3.55, 3.56, 3.60, 3.61, 3.65, 3.66, 3.70, 3.72, 3.73, 4.00, 4.10, 4.11, 4.20, 4.21, 4.25, 4.30, 4.31, 4.40, 4.41, 4.45, 4.46, 4.50, 4.53, 4.55, 4.60, 4.65, 4.66, 4.70, 4.75, 4.76, 4.80, any ps3, cfw, custom firmware, darknet, downgrade, download, easy, Ferrox, guide, jailbreak, mega, ofw, Phat, rebug, Rogero, Slim, tutorial. Bookmark the permalink. Thanks ever so much for this tutorial. I never would have been able to downgrade without you. The only issue I faced was that it wouldn’t let me install the 2nd update using System Update option so I had to update via the recovery menu instead. Keep up the good work. when does your ps3 say they are corrupt? the files are still fine so you must do something wrong. can you tell me what step failed? BTW, this guide only works on jailbroken ps3’s with already custom firmware installed… it won’t work on official ps3 firmwares. if it gives that error use another usb stick formatted in FAT32. does the error occur on the QA flag application or the update? wont install the second CFW, it says its already up to date and doesnt require to be updated, can I install any other cfw besides that one? Under debug setting went to system debug update and switch it ON. Then installed Rogero 3.55 v3.7A CFW in safe/recovery mode. Using the irishman instead of multiman, running games that were not working before, so better for now. 1. Under debug setting went to system debug update and switch it ON. Ray, I just got a Slim 3.55 PS3 that I guess is on DEX Rebug but not running Debug CFW. All That I See Is “Debug Setings” Under “Network Settings” and When Opening Rebug Toolbox It states I’m not running Rebug. The LVL2 Kernel Is (CEX) and The Target Type Is (DEX). When I Try Using The Rogero 3.55 Downgrader It Keeps Bringing Up That The Data Is Corrupted With Error Message (80029CCA). Tried Everything I Could Think Of, Even Updating in Recovery Mode. Which one would you recommend I try? Im barely getting back into jailbreaking/modding after 2-3 years. sorry for all these noob questions lol. All im trying to do is basically get online and hack/mess around on GTA. you could try inserting a empty hdd and reinstall the firmware on the empty drive. what’s your current firmware version? did you eject your cd before installing the downgrader? same here error (8002f957) I have both ps3 Fat and a slim one. SLIM one already jailbroken but the fat one my brother accidently updated to 4.60 ofw. you’re welcome. you probably didn’t read every step like most of the people that are complaining. What is the firmware you are trying to downgrade? I tried updating with the downgrader and it gives me the same error message. I followed the directions as well. I’ve tried countless websites for 7 hours straight today and with all of them im getting the same error (8002F957). I have a ps3 slim and its already been jailbroken but my friend updated by mistake last night so im really trying to see if i can fix it! Not complaining just depserate for some help. well you can’t downgrade your ps3 if your friend installed an official firmware. you will need to downgrade with a flasher. Thank you very much! First i got files corrupt but this workaround did it. did you enable the QA-Flag? => are there 3 new icons in the settings tab? When I unzip the 3.55 firmware and put it into the folder, it is still in firefox ?? Do you know what I mean ?!! Not sure what you mean, i’m using chrome… the zip should be extracted anywhere on your pc, this has nothing to do with firefox? Thank you for reply Steven !! I put unzipped file into new folder UPDATE ( PS3 ) , but when I try to open it on my PC , nothing happens ??? Is this meant to happen or should I be able to see whats on the file ?? Or is this file only readable on PS3 ??!! this will only work on custom firmware! hmmm, probably a bad hdd drive. i’ve seen this in many ps3’s… these drives die after a few minutes of “heavy activity” but still work after a reboot..until another few minutes of “heavy activity” occur. -check if your ps3 always freezes at 72%, if not its is 100% a bad hdd. could you try another drive, pretty sure it’s your drive. seen these problems with multiple ps3’s.. the data on the drive may be correct but the drive mechanism fails i tried to use a drive like that as a external drive for my pc… after copying some/many files the drive just fails in windows to. there are probably a lot of small files being copied around 75% of the update. I have tried to downgrade another CFW PS3 with a NEW 500GB Western Digital Seagate HDD I had replaced last week (I am downgrading this Custom Firmware PS3 for a friend). Using the same method the PS3 still freezes at around 70%. Both console are in Grade A excellent condition. I am downgrading these consoles because the current CFWs are bugged and unstable. Are there any other methods of downgrading custom firmware consoles to 3.55? Thank you for your time. However i’m still confused why the firmware Randomly stops around between 70% and 77%. what’s your current cfw? you can try overwriting your current cfw with another cfw from another developer of the same version (can be done in recovery mode), then try to downgrade that firmware. maybe it’s caused by the bad/unstable cfw you have installed now. hi can u help me. i have been trying to do this the whole day and once again says that the data is corrupt. what should i do bro. Having the a similar issue: Have done the first update, and enabled QA. Launch 60GB: Upgraded HDD, original Blu-Ray. i followed all the steps upto where I am stuck. when I try to update from storage media it says that there are no applicable update files or something,. any ideas? you could at least tell me where you are stuck if you want any help, is the usb in the most left usb slot? is the usb fat32?is the update called PS3UPDAT.PUP and placed in /PS3/UPDATE/?… what’s your current firmware? Will this work if the PS3 Logic board is broken? I am on ferrox 4.70 no bd and want to downgrade back to 3.55 or is there some way i can remarry another logic board to the console?? This should work without BD drive or with broken BD drive. You are lucky, you can install the CFW directly from your 3.55, just choose a CFW, place it in the correct directory on a USB drive, REMOVE ANY GAME DISKS, update from usb. You can just install the latest CFW available, The chance of bricking your ps3 is pretty small since there is a recovery menu which allows full reinstallation of the (cfw) firmware. great to hear you succeeded, I don’t advise streaming your iso’s but just use a external usb hdd. the best way to transfer games to your ps3 over FTP will be by using a cross-cable, you can achieve 40-50Mb/sec that way but it can be hard to setup. I never used any managing software on my pc, i just extracted and transferred my games to the hdd & used multiman to boot. Thanks, I appreciate it. Was nice to have a Veteran to the scene advise me. As for your suggestions, I agree with you in terms of best approaches. But right now I’m try to work within my budget; so since I can’t afford to get myself an enclosure right now I wanted to try streaming. I might end up attempting to convert one of my Ethernet cables to a Crossover (hopefully don’t mess it up). you don’t need a crosscable to stream your games, the 8 megs should be enough. is that work on firmware 4.75 official? Is there a way to jailbreak a fat PS3 official version 4.75. Thanks Steven that is a very useful guide for people that never downgrade a console, i downgraded over 6k ps3 for the last 6years so if anyone need a Downgrade here in UK contact me i have tons of great Reviews once again Steven Top guide with pictures ++ it will help lots of people . Am I correct Steven ? You should try to install via recovery menu. if it still says corrupt data? Use of this website or material is, at all times, "at your own risk." If you are dissatisfied with any aspect of the website, any of these terms and conditions or any other policies, your only remedy is to discontinue the use of the website. In no event shall I, the website, or its suppliers, be liable to any user or third party, for any damages whatsoever resulting from the use or inability to use this website or the material upon this site.